Christmas gift that you can re-gift!!! Rock Solid Karate is going to give you a gift next week that you can re-gift and we won't be offended!! In fact we encourage you to do just that. 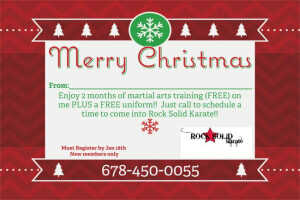 Give this card as a gift to someone that you know, that you think would benefit the way you or your child has from the martial arts at Rock Solid Karate. These cards should be in this week and we will start handing them out (1 per student). Simply write their name on it and give them to it and they can redeem. If someone comes in using your card that will go towards a referral to win the wave master placed at the front of the studio.